Mother Nature has brought us another crazy weather week in the Midwest. On Sunday we had sunshine, amazing temps and a little wind. Monday, no wind & 80 degrees. I laced up after work, welcomed the good weather and hit the road even though I’m not at all acclimated to running in 80 degrees! I thoroughly enjoyed it! By Tuesday, it was going downhill as the storms moved in bringing back the cold, rain and severe weather. Last night was not warm. Or dry. Or fun. However, it was still WED and that means a 5pm run with the running club. The running club where people show up regardless of the weather. The running club that holds it’s members accountable during good weather and bad. During short runs and long ones. Accountability is a powerful thing and it brought 4 of us out last night even in the blowing rain. Yes, a small number compared to normal but runners still showed up! I have to shout out my thanks to these people. Susan (not pictured), Betsy & John. Had it not been for them, I would have gone home. I think we are all at our wits end with the cold. Then add blowing rain and it would have been over for me. In fact, I’m pretty sure we all sat in our car for a bit mumbling under our breath when others pulled into the parking area. But hey, what are friends for if not to help us move it up and out when we would rather go home and be lazy. So if you’re having trouble getting motivated. Or staying motivated. Or training consistently ….. I strongly encourage you to find a group, partner, or running club with whom you can be accountable. It helps. It works. It will be a game changer for you and enable you to take your runs/workouts to the next level. So get out and go, regardless of the weather. Just try to dress appropriately and avoid lightening storms. Other than lightening, you can probably survive AND enjoy running in just about any type of weather. Try it. Do you have a running partner, or members of a run club, that you can always count on showing up? This entry was posted in Running and tagged Accountability, be accountabile, Running, running groups, running partners, train better with a group by tootallfritz. Bookmark the permalink. n this morning in the pouring cold blowing rain…. It is still misting out there even now…. 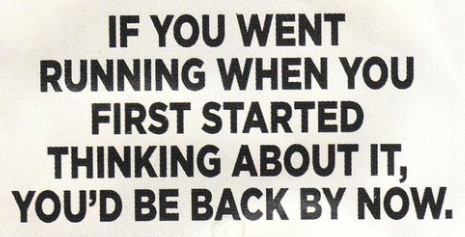 need to get going…. Mischief wanted to go so I took him. I don’t think he realized it was raining as hard as it was. He basically pulled me the whole way which I normally do not allow but it made me go faster so we really flew!!! Good post! Accountability is important. Not sure learning to enjoy applies to bad conditions, but perhaps to persevere and endure is better way to view it? U I depend on to show-up! No! I wish I did. I don’t really have any friends that live over by me that are into running. I may have to join a running group as I train for my first marathon later this year! I think it will totally be key! Your group sounds awesome! Can’t say that I would be there to run in the rain! Oh I love running in the rain! There is something so refreshing about it. Maybe it’s because I run “naked” when it’s raining! No music, no Garmin. Just me, the rain, and the run! I usually don’t mind running in the rain but the cold blowing wind made it a little rough in sections. I’m definitely ready for some spring temps.